Explore the best of New England on this week-long adventure trip. Hike in Vermont's Green Mountains, explore historic Hanover, New Hampshire, and hike along the Appalachian Trail. In the White Mountains, hike to the summit of Mount Moosilauke. Celebrate the end of the week with a rafting trip on the Deerfield River. At every step of the way, two caring Overland leaders will create a supportive, wholesome environment where the focus is always on having fun and making friends. This summer, join Overland for a week of mountain and wilderness adventures in the heart of New England! Friendship and fun in the heart of New England’s mountains—what more could you ask for? We’ll start in Williamstown, Massachusetts, with a short orientation to get to know each other before we head across the border to southern Vermont. In Vermont’s Green Mountains, we’ll hike Haystack Mountain—a great first hike—and enjoy a four-state view from the top. From Vermont, we’ll head east into New Hampshire for a hike on the Appalachian Trail and a challenge hike to the top of Mount Moosilauke, a 4,802-foot peak in the White Mountains. We’ll end the week with a rafting trip on the Deerfield River. At every step of the way, your Overland leaders will be there supporting you, encouraging you and cheering you on. 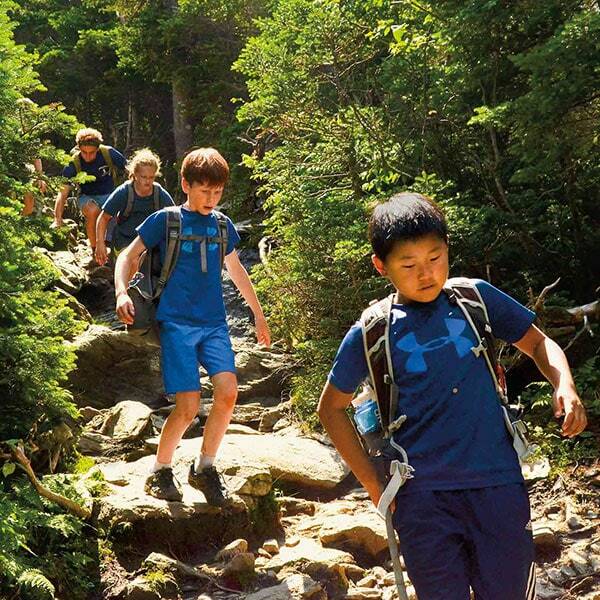 As with all of our introductory trips, New England Adventure is designed for our younger campers who are eager to try a new summer adventure and who are ready for a week of outdoor fun in a supportive, wholesome environment. The hiking—from Haystack to Moosilauke—is chosen for its appropriateness for this age group, and the rafting is on the dam-controlled Deerfield River in rafts guided by professionals from an outfitter we’ve used for decades. New England Adventure is a chance to make new friends and have fun, while building independence and self-reliance. All in all, New England Adventure offers a wonderful week away and an exciting introduction to Overland. We chose Overland for its reputation of excellence. Fun, friends & adventure: the best week of your summer. Our trip starts in Williamstown, Massachusetts. We’ll spend our first afternoon getting to know one another, playing fun games and going on a short, beautiful hike. From Williamstown, we’ll drive north to Vermont’s Green Mountains, just east of Bennington. We’ll hike to the summit of Haystack Mountain and enjoy a stunning four-state view of the surrounding valley. Camping next to a peaceful lake, we’ll swim, play games and make s’mores around a campfire. At night, we will reflect back on the day and share our favorite moments before climbing into our tents. In Hanover, New Hampshire—a quintessential New England town and home to Dartmouth College—we’ll hike a section of the Appalachian Trail near the Dartmouth Skiway. We’ll spend the late afternoon relaxing and exploring the town. Next, we’ll head to Franconia Notch State Park in New Hampshire’s White Mountains. We’ll hike to a beautiful lake with incredible views of the iconic Franconia Ridge. We’ll wake up early for our challenge hike. Together, we will hike up Mount Moosilauke (4,802 feet) and enjoy a spectacular view of the Presidential Range and Mount Washington. We’ll return to Williamstown and the Berkshire Mountains for a fun and rewarding rafting trip on the Deerfield River with professional guides. The Zoar Gap, a spectacular section of the Deerfield River, is a great balance of fun rapids (class II and III) and calmer water. On our last night together, we’ll celebrate our week of fun and discovery together on New England Adventure. 6 nights of frontcountry camping. Campground facilities will vary and may include flush toilets, hot water, showers and/or laundry. If you are flying to your trip, carry your sleeping bag with you in case your checked luggage fails to arrive on time. Sleeping pads will be provided by Overland. What is the weather like on New England Adventure? How often will my child have access to showers? Nearly every day, and most students shower regularly. Come next summer, explore the mountains of Massachusetts, Vermont and New Hampshire.